This year, a San Francisco Bay Area radio station, KPFA, will offer a scholarly book as a gift in its July 2016 pledge drive. Sure, these pleas for listener contributions often give away books, along with the iconic tote bags and baseball caps. But this particular book is not the usual token of appreciation. 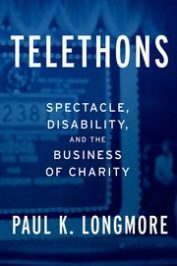 Ironically, Paul K. Longmore’s, Telethons: Spectacle, Disability, and the Business of Charity exposes the problematic history of fundraising and charitable giving. In fact, the book–and the gift– push us to look at the real damage that’s done when pathetic and tragic images of disabled people are used to raise money. A film such as the recently-released “Me Before You” that celebrates a disabled man taking his life to unburden his non-disabled personal care assistant isn’t about someone’s choice to end his life; it’s actually an example of having too few choices for how to think about disability. We’ve been brainwashed by programs such as the pity-inducing telethons which, because of their monopoly for over a half-century, eclipsed other stories, other images, other possibilities for living as a person with a disability. In their heyday, everyone knew of the telethons that dominated American television for a half century. Over the years, they slowly faded away from popular culture until the last one aired with barely a whimper in 2015. A portmanteau of “television” and “marathon,” telethons first took root in the 1950s, primarily to raise money for disability-related charities. Initially, these over-the-top, cheesy variety shows were local and lasted just a few hours. But quickly they grew into a national phenomenon that sometimes ran nonstop for over 40 hours (remember, only a few channels and no Internet!). Despite kitschy programming, telethons were serious (big) business for disability-related charities such as March of Dimes, American Arthritis Foundation, United Cerebral Palsy (UCP), Easter Seals, and Muscular Dystrophy Association (MDA). Among other things, they influenced how Americans thought about generosity, corporations, healthcare, and disability. To be sure, thanks to the billions of dollars they raised, telethons genuinely helped some people. For example, they made it possible for someone to get a wheelchair when they couldn’t afford one, attend summer camp, and of course, helped fund medical research. And they put people with disabilities, long hidden away at home, in public in ways unprecedented in history. Indeed, thanks to the programs, many people with disabilities discovered other people like them for the first time. 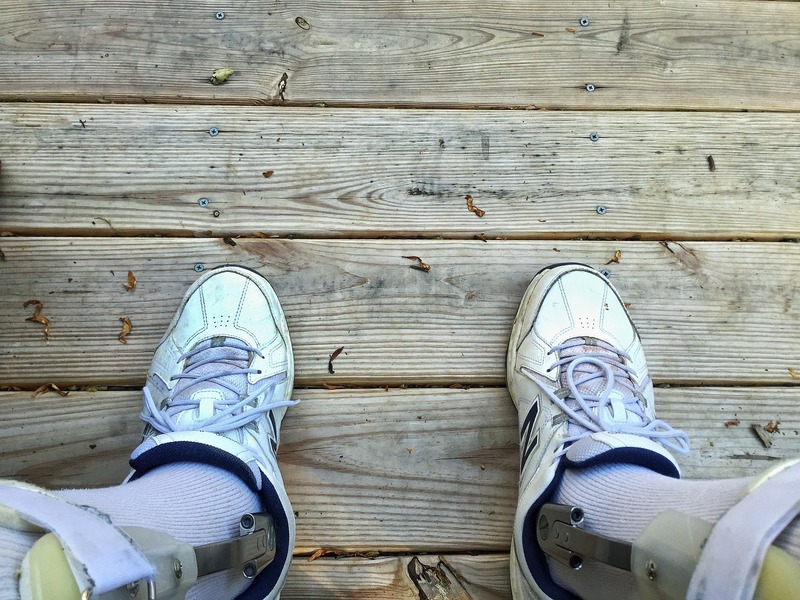 Disability braces by gmwolford. CC0 Public Domain via Pixabay. But the good was far outweighed by the toll it took on disabled people. The organizations raised this badly needed money by playing on viewer’s emotions to show disability as horrific and creepy, as in this video where a man plays the part of a stalker. Meanwhile, people with disabilities were cast as helpless and pathetic victims of tragedy. Taking a page right out of Victorian sentimental literature (think Tiny Tim in Charles Dickens’ A Christmas Carol and other tales of woeful afflictions), children and their families made desperate pleas to viewers. Or they were heroic, brave overcomers who did everything they could to prove they weren’t really disabled. Whether victims or heroes, people with disabilities had no voice other than to reinforce messages of the able-bodied hosts and celebrities who depended upon disabled people to be victims of tragedy. Since viewers never got to meet disabled people who thrived and actually lived full lives, it seemed perfectly okay to help fund medical research that would eliminate them, all of them. Equally problematic was the unrealistic goal of curing all disability, and the reality that people with disabilities would always be part of even the most modern societies. Put another way, the programs left little room for disabled people who would go on living, often even happy with their lives. Indeed, watching the programs you’d wonder if many disabled people ever grew up. This was because disabled children proved effective fundraising tools, to the point that they became part of the entertainment as they struggled to walk across the stage to much applause. Years later, some recalled their crutches being taken away so that their struggles appeared even harder to the spell-bound audiences. Many remembered hosts smiling down on them as they heard parents and others exclaim how hard they made life for everyone. The issue of course isn’t that people need help that generous souls can and do provide—it’s more how that help is awakened, what images media trot out to reinforce existing prejudices against disabled people. Without positive examples of individuals thriving and shaping their world, little wonder that the protagonist in “Me Before You” would decide to end his life and that viewers would applaud this as death with dignity. But change is in the air. Even if mainstream media continues to promote films like “Me Before You”, social media offers more options. Campaigns such as “This is What Disability Looks Like” on Facebook and #SayTheWord on twitter promote complex, interesting, unexpected views of disabled people from a disability perspective. Meanwhile, university programs and courses and grassroots film festivals question how people with disabilities have been and can be represented. There are also calls for seeing disabled people as a political constituency as well as Crip the Vote. The pledge gift of a book about telethons from KPFA offers an example of this new thinking pushing through and pushing back. What sweet irony to learn a book that exposes how people with disabilities are exploited for fundraising will help keep “Pushing Limits,” a radio show run by and for people with disabilities, on the air. In this knowing wink among fighters for social justice there’s something much bigger: it’s a fiendishly subversive protest not with bullhorns and signs, but with lifted finger at a whole system that sacrificed dignity in the name of charity. Featured image credit: “Colorful Telephones” by Mark Fischer. CC BY 2.0 via Flickr. Catherine Kudlick is Professor of History and Director of the Paul K. Longmore Institute on Disability at San Francisco State University. She oversaw completion of Paul Longmore’s posthumously published book, Telethons: Spectacle, Disability, and the Business of Charity. Wonderful article. I loved it. Congratulations. I am blind and I am from Mexico. I think this article is really aligned with the current ideas of many of us who are trying to make a change in society mentality. I would love to translate this entry into spanish so this idea can reach more and more people. Thank you for sharing this. thank you for this comment, that I’ve only just seen! I would be delighted to have you translate this!!! Please contact me at through my email at San Francisco State University.